A tough British commander, and a rebellious American, clash in a WW2 Japanese prison camp. 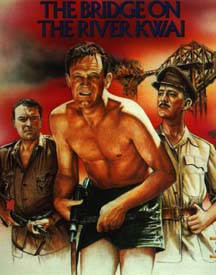 Director David Lean's "Bridge on the River Kwai" is an epic of a sweeping, highly moving, war-time drama. The glittering cast includes: William Holden, Alec Guinness, Jack Hawkins, Sessue Hayakawa, Geoffrey Horne, James Donald, Andre Morell, and Ann Sears.